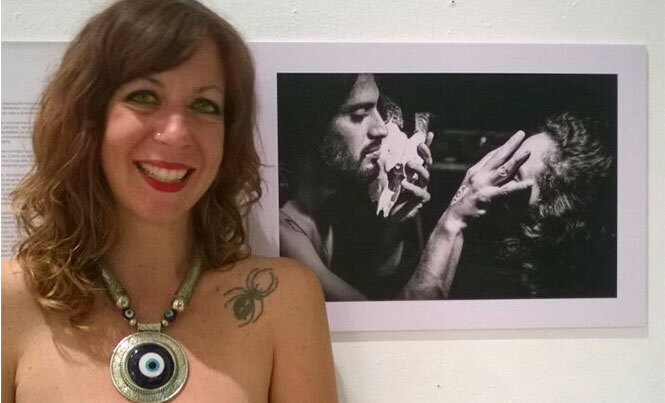 On Saturday, February 12 the visual artist Agata, better known as LunAzul, presented her photographic exhibition “Life and Death” in the Teatro de la Ciudad in Playa del Carmen. Agata is of Argentinian background and is an artist that has spent time traveling to various countries, usually for five years at a time. Her longest stay was in Canada, where she studied Visual Arts, and now Mexico. After a few years of living in Tulum, balancing her time between working in tourism and her artistic production, she decided to move to Playa del Carmen and expand the horizons of her career, devoting herself entirely to painting and photography. Now she presents her work entitled “Life and Death,” her first photography exhibition in Playa del Carmen. Utilizing a good mixture of technical and creative skills, along with fragments of the work of Edgar A. Poe, Agata has created portraits that explore the depths of relationships, the intimacy between couples, the light and the dark, the feminine and the masculine. She depicts the sacred bond between man and woman, and the natural dynamic between life and death. In this way, she continues with her love of telling stories. The evening drew a good response from friends and acquaintances that attended. Guests were treated to live music from the band Lecle, from Tulum, who are friends of the artist. Despite her multifaceted interests in various art forms, Agata admits that she enjoys painting as much as she does photography. She says that when she paints, she becomes a channel and that with a camera it is possible to capture the essence of a person in the moment. Let us welcome Agata to Playa del Carmen! Thank you for the interesting shows.